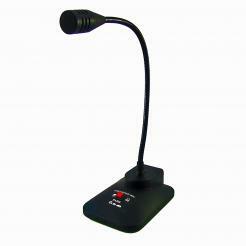 Weltron Hi-Low Impedance Dynamic Microphone. The C-1U is a digital home recording or podcasting enthusiast’s dream come true. Just plug it into your computer and start recording! Weltron 37-333 high quality goose-neck counter top microphone with weighted base, XLR connectivity, wide dynamic pattern, push on/off to talk button.